The rise of nationalism and xenophobia in Europe has been a reality for the past years. The economic crisis, coupled with an ongoing migrant and refugee plight, encouraged many Europeans to show their discontent towards their leaders’ policies, by voting for far-right/leftist political parties. Countries like Austria, Italy, Holland, Germany, France and Finland have witnessed sharp gains of nationalist parties, while others like Spain faced regional nationalist organizations and autonomy movements. The Visegrad group of Central Europe, had been united opposing the equal redistribution of the refugees and the EU's quota of migrants while in Greece, the Golden Dawn party is now the fourth most popular one, while it was only a minor party before the crisis began. Brexit is perhaps the most dramatic response to the increasing fear of immigrants. One of the oldest members of the EU has decided to leave, in fear of having to accept more immigration, both from within and outside Europe. The overall picture does not look good, when the continent is trying to promote itself as a union or a commonwealth of nations who are working together for the betterment of all its members. And most disturbing of all is that the rise of nationalism does not only threaten the very union and cohesion of the European Union, but it shows its ugly and brutal reality to the immigrant communities and other minorities in the EU. Most of these nationalist, anti-EU groups' rhetoric, combined with an utter failure of the continent's governments to counteract it (if anything they promote it to divert the public’s anger towards foreigners), has transformed many European capitals into segregated communities, where tensions often rise. We need to take a moment and think. Europe has faced numerous migration movements in the past, both from or towards its territory. The Greeks, which nowadays are conveniently reminded by the right-wing elements in their country about their impressive ancient history and the achievements of their nation, were the first to have to deal with a multiracial, multi-ethnic civilized society. They surely forget the part of the Greek history, when their ancestors themselves have embraced cosmopolitanism and multiculturalism. In fact, the first European race of people to promote multiculturalism were the Greeks. After the conquests of Alexander the Great to the East and the establishment of the Greek Kingdoms from the Balkans to India, the mentality of the ancient Greeks started to dramatically change. Young Greeks migrated and colonized these new lands, promoting the Greek language and culture throughout the Hellenistic states and being influenced by many different cultures, ethnicities and religions. It was then that a new kind of social philosophy started to emerge among the Greeks, called Stoicism. Its roots can be traced back to the very Greek capital-Athens, which now is a battleground for nationalism versus more liberal ideas, just like any other European capital. Stoicism is a school of Hellenistic philosophy that was established in Athens by Zeno of Citium. A distinctive feature of Stoicism is its cosmopolitanism. Stoicism postulates that all people are manifestations of the one universal spirit and should live in brotherly love and readily help one another. A Greek Stoic called Epictetus commented on man's relationship with the world: "Each human being is primarily a citizen of his own commonwealth; but he is also a member of the great city of gods and men, whereof the city political is only a copy." 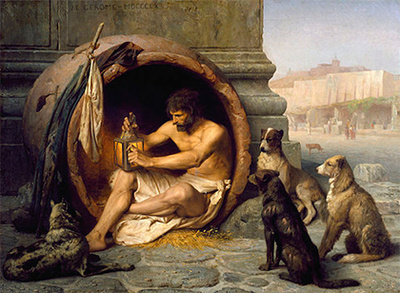 This sentiment echoes that of Diogenes of Sinope, who said: "I am not an Athenian or a Corinthian, but a citizen of the world." The Stoics believed that external differences such as rank and wealth are of no importance in social relationships. Instead, they advocated the brotherhood of humanity and the natural equality of all human beings. Even Alexander the Great himself, still a revered figure in Greek history, was trying to create an empire by mixing Greek and Asian elements of culture and of course the people. He married an Asian woman, Roxana and he encouraged all his officers to follow his example. This is something that the Greek nationalists usually leave out, or conveniently forget when they preach hatred against foreigners, referencing the greatness of the Greek nation. In fact, not only do they not do any justice to it, but they are vilifying the very “greatness” that they preach. Similarly, other nationalist parties across Europe only refer to a more one-sided story, leaving out inconvenient parts of their history. Recently archaeologists discovered Viking clothing with Islamic inscriptions, something that implies a certain level of cultural and perhaps even ethnic mingling between Nordic people and the Mediterranean. If we take into consideration the colonial era of our continent, when Europeans traded, conquered colonized, enslaved and intermarried with the inhabitants from all other continents, then how can we now complain about globalization? We started it, we are the ones largely responsible about the formation of the modern world. Our power struggles and cultural, religious and economic expansionism created most modern nations and not just in Europe. Many countries in North and South America, Australasia, Africa and Asia, have been established after colonialism collapsed and they were the result of European influence. Our ideological struggles, caused two world wars, dividing the globe into two types of economic models, that all the way until the early '90s had significant influence around the planet. Why are we surprised now that people around the world, still see Europe as a beacon of prosperity and opportunity? We cannot absorb all their numbers, but we could certainly start feeling a bit more comfortable with what we have created and promoted anywhere else; cosmopolitanism. If Europe claims the heritage of Ancient Greece, it also needs to start admiring and studying its later days. When the Greeks before they succumbed to the Romans, begun themselves to philosophize their role and position among the human kind, giving rise to new ideologies and even religions like Christianity. In addition, we need to start preparing for a multi-polar and more equal world. The more other regions remain poor, the more they will see migrating into Europe or the US as their only option for prosperity and the migrant flow will never stop. To deal with it, we will have to leave protectionism behind and start walking at the footsteps of our ancestors, becoming pioneers of trade, globalists and citizens of the world. We were the ones to instigate a world with open borders and free movement, although in the past it was under our dominion. This time we could go a step further, turning Europe into a continent at the forefront of human cultural, economic, ideological and political evolution, one that will work with others for the betterment of this world, rather remaining insecure behind closed borders.